Fresh & Light All Day Odor Control scented multi-cat scoop cat litter eliminates odor ’round the clock. 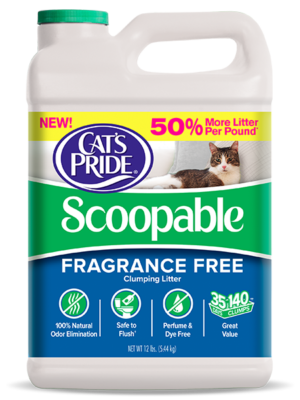 Made from super absorbent clay, it provides 3X longer lasting odor control* than the leading national scoopable clay cat litter. This heavy hitter is up to 40% lighter with the same number of uses† so you get all the performance without the heavy lifting. *When used as directed, based on laboratory testing. Fresh & Light All Day Odor Control is rated 3.4 out of 5 by 26. Rated 5 out of 5 by Macy678 from Excellent product Bought this for the first time a few months ago and it works great, little to no odor! Rated 5 out of 5 by squigqueen from Great Odor control!! Having two senior cats, I need a litter that absorbs odors and this one is great! Recommend this to friends with multiple kitties!! Rated 5 out of 5 by Carly from Controls odor I love the odor control of this litter. Works great for my 4 cats! Rated 5 out of 5 by Higgins from Love this Litter! I bought Cat's Pride Fresh & Light all day odor control litter a month ago, inspired by the coupon on the package. Love this litter, so glad I stumbled upon it. No ordor, easy to scoop, easy to flush. My cat, Jazz, a rescue, loves it too! Rated 5 out of 5 by Midnites mom from Best Litter Around This is the best litter I have found. Truly controls odor. But now Walmart in Jasper, Indiana has opted to stop carrying it and I have to find a store that does. I will drive wherever I have to, to buy this litter. Rated 5 out of 5 by Marian2010 from I have no complaint I have 10 cats and I think the pet lover who complains about this cat litter, needs to clean the litter more than once in 24 hours, I clean mine out several times a day as needed and I have no order in my home only when use is fresh so I go and clean it and odor is gone. What would you house smell like if you didn't flush it only every 24 hours. Rated 5 out of 5 by LenM from Very happy first-time user! I don't get what the negative reviewers are talking about here...I normally get the 'pink lid' bottle, but it was out of stock at my grocery store so I tried this one instead. I quickly found that I prefer this to my regular purchase. There seems to be even less dust than normal, and the litter itself has a surprisingly pleasant smell. The best part is I have experienced no cat odor whatsoever since I started using it. I will definitely be looking for this type from here out!! Rated 5 out of 5 by princesswillie50 from Best Cat Litter Around This is the best cat litter around, I've tried two other cat litters nver again. The others had some order control but when Ruben would use the cat litter box, I couldn't stand the smell. With Cats Pride the oder control is not over powering and it clumps up and the price is great! Thank you Cats Pride for make the best cat litter! I have been using Cat's Pride Complete for my 2 cats. They are very picky as to the litter that I use. But I have been unable find it lately. Do you still make this product, and who carries it? Thank you for your inquiry! Unfortunately, Cat's Pride&reg; Complete scoop has been discontinued. Consumers and retailers are choosing lightweight litters that clump and control odor just as well or better than heavyweight litters. Please contact us for coupons related to Fresh &amp; Light Quick Action scoop. 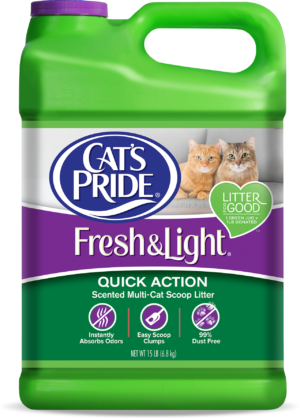 It is our lightweight scoop and contains some of the same ingredients as Cat's Pride&reg; Complete. Contact our consumer relations 1-800-645-3741 ASAP. Thanks again. Thank you for your continued support too! My cats and I don't like the litter that looks like little pointy rocks, is the green jug litter like that? Right now I buy Pestel brand litter. Also do the larger boxes count for shelters? I have 14 litter boxes so I go through a lot of litter. Thanks for your question. Fresh &amp; Light&reg; All Day Odor Control Scoop is available at Krogers and Pets Supply Plus near you. 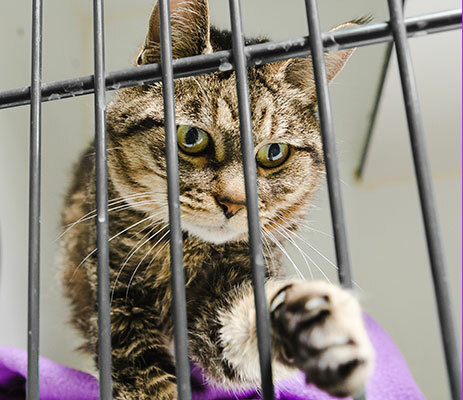 Your inquiry and support of Cat's Pride&reg; are greatly appreciated! Will this kee the smell down after my cat uses his box. He doesn't cover ??? 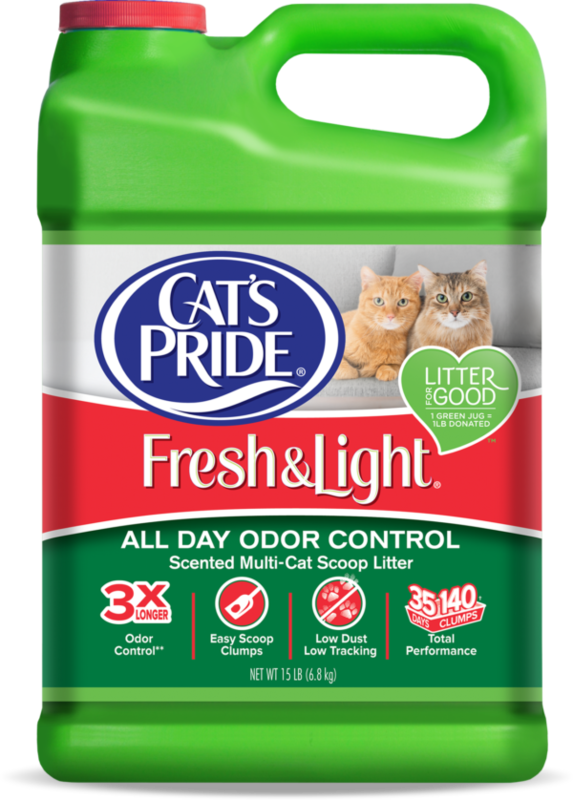 Our Cat's Pride&reg; Fresh &amp; Light&reg; All Day Odor Control cat litter offers three times longer lasting odor control as compared to other leading scoopable clay brands. You should find great results with your cat and this product!! Too much dust! Can you please look into reformulating this product. I'm using the Cats Pride Natural product, virtually dust free! We are very sorry to learn of this complaint. We work diligently to reduce dust during the production of this product. Please contact our consumer relations department (1-800-645-3741) for immediate assistance in correcting this incident. We wish review the product and the product's code to identify the production details. We hope to hear from you soon. We, again, are very sorry about this specific incident with our product. Does it really have low dust? We greatly appreciate your question and support. Yes, our Fresh&amp; Light&reg; litters offer low dust. A unique treatment of the product is applied to reduce dust in these products. Thanks again for your support!